A better response on Jet Fuel Pricing..
After a poor response from ERB on Jet Fuel Pricing, we now have a more reasonable approach from Evans Chibiliti (Secretary to the Treasury) who seems to acknowledge that something is odd. See here and here. In the domestic foreign exchange market, the Kwacha maintained its resilience and appreciated against the major foreign currencies with the exception of the Euro. The Kwacha extended its gains against the US Dollar and appreciated by 4.2% from 3.3% in the previous quarter......The general appreciation in the Kwacha was due to stronger supplies of foreign exchange into the market relative to demand and the sharp weakening of the US Dollar in global markets triggered by the ongoing credit crisis. The factors accounting for strong foreign exchange inflows are high copper prices in international markets and increased foreign investor participation in the Government securities market following the reduction of interest rates in the US. These rate cuts and growing concerns that the sub-prime triggered credit crisis may result in a recession of the US economy, have subjected the Dollar to severe downward pressure on global markets. Copper export earnings at US $886.0 million were 3.2% higher that the US $858.4 million recorded during the previous quarter, reflecting higher realised LME prices which increased to US $7,746.94 from US $6,949.22 per ton. However, copper export volumes declined to 114,367.8 metric tons (mt) from 123,523.8 mt. Compared to the corresponding quarter in 2007, export receipts were also favourable as they were 34.7% higher than the US $657.5 million realised in that quarter. Again this upper figure for March being quoted at US$7,746 per tonne is not consistent with the infomine.com . I have also checked the London Metal Exchange historic data. It also shows a much higher peak. See the graphs below from both sources - essentially with the same profile. "In 1998, Sadc faced an invasion of a member state. Only Zimbabwe, Namibia and Angola had the courage and conviction to go to war in defence of that country. No one else did, not even the then chairman of the Organs who today exhibits unfamiliar cheek. Let's not flaunt courage from a Dutch bottle, or from disability threatening to unhinge brains.Zimbabwe has peace, more peace than many in the neighbourhood. Zimbabwe runs better elections, far better than any on the continent. Let us not have holy sermons from out and out sinners who have offended democracy a thousand times over. We have had election-related riots in the neighbourhood. We have had national armies deploying to battle a bitter and outraged opposition in streets of capitals. Businesses have screeched to a loud stop, not far from us. Results have been tempered with, with well-documented assistance from the British whose record of fudging elections date back to Nkrumah's Ghana. " A new paper provides further evidence that high tax compliance costs and weak legal institutions creates barriers to the access and use of bank credit by informal firms. Our paper provides empirical evidence of a strong negative association between informality and bank credit. In line with our model, we find that a firm’s reliance on bank credit is positively associated with the quality of the legal environment and is negatively associated with weaknesses in tax administration, as proxied by bribes to tax collectors and the severity of tax administration constraints. By contrast, weaknesses in tax administration are positively associated with the use of informal credit and with the probability that firms self-report the availability of financing as a major obstacle to their operations. Moreover, we find a differential impact of the legal environment and tax administration constraints on access to bank and informal credit by formal and informal firms. In particular, we find that an efficient and well-functioning legal system increases access to bank credit even for financially opaque informal firms while lowering reliance on informal credit by formal firms. Finally, we find that weaknesses in tax administration increase reliance on informal credit by informal firms more significantly than for formal firms. A very important issue for Zambia. About 69% of Zambians operate in the informal sector. Agriculture accounting for the largest share at 87%. Its widely accepted that apart from reducing government revenue, informality discourages firm performance and reduces firm growth and innovation. If we are going to make progress in this area, we need to do more than just subsidise cheaper credit, we also need to alter the incentives that prevent people from using credit markets in the first place. Government policies are needed that reduce tax and regulatory constraints and improve the legal environment (especially in rural areas). This would reduce the incentives for firms to operate informally, both by increasing the benefits of accessing formal credit markets and by reducing the costs of doing business. Chingola Council town clerk Charles Sambondu explaining why Onshore Construction Limited, an Indian company, contracted by Konkola Copper Mines (KCM) to work on its smelter project in Chingola may face legal action following public health concerns involving its expatriate workers. His comments ignited a wave of comments from politicians, who are now asking why the Immigration Department agreed to issue temporary permits to the 'unskilled' Indian workers, at the expense of 'qualified' locals. Presumably the assumption being that if these were indeed "skilled workers" they would not agree to live under such poor health conditions. Not necessarily true of course, but such logic plays very well in peoples mind. The Environmental Council of Zambia are currently consulting on the social, economic and environmental impacts of the Freedom Park Shopping/Hotel Complex, Kitwe . Deadline for comments 28th April 2008. Thura Kaira, the Zambia Competition Commission Director has weighed in on international gateway access issue. Among the comments attributed to him, includes the view that "the US$12 million licence fee for the international gateway was commensurate with reasonable international standards". Seems pointless to me what the international standards are. What Mr Kaira should focus on is on whether this is a barrier to competition in the Zambian market. Also I am not sure what he means by "reasonable international standards". Which country is he comparing Zambia with? In Kenya, the license cost is $214,000, while in Uganda it is pegged at $50,000. The Anti Corruption Commission website has been re-launched. The website has been developed with support from USAID and the Millennium Development Challenge corporation through the Zambia Threshold Project. The ERB released the report last week into that terrible weekend when I was stranded in that shambles of an hotel called New Savoy (Ndola) without power. You can read the lengthy press release here. Carol White reckons there are opportunities galore for Zambia to grasp greatness. All that seems to stand in our way is lack of action on the part of ordinary Zambians. Depending on your point of view, she's either very optimistic or simply naive when she calls on you to "stop waiting for government policy to support and cushion economic growth - what are we doing about participating in the blossoming of Zambia? It’s not about money it’s about taking action . Let’s get cracking." Media reports that Equador plans to create a state-owned mining company to exploit the country’s mineral reserves, which are estimated at $220 billion. The Post are reporting that Zambia collected $4bn in taxes last year. Either the author was drunk at the time of writing or Fundanga was drunk when he was being interviewed. I rule out the possibility that both were sober throughout the process. Read more here. Good to see that The Post has now quickly corrected this story. "This is a constitutional office and discusses national issues. We want to know why there is no response to our resolutions otherwise what is our contribution to national issues ?" No one actually knows the current role of the House of Chiefs. We know that it was created by Kaunda to keep chiefs quiet. Now with Zambia having resumed the democratic path, the chiefs are now rightly asking whether they are providing value for money to the tax payer. Its interesting that it is the chiefs who are asking these questions. Many people am sure think chiefs simply enjoy to sit tight and enjoy the money. There's no doubt, that with the National Constitutional Conference currently sitting, with chiefs heavily represented, they now sense that the time is right to redefine the role of the House of Chiefs. Although the initial calls are based on the desire for independence, it strikes me that the problem is one of a clear rationale for a House of Chiefs, rather than the degree of independence it should have. We need to first define what it is there for, before we can decide the appropriate institutional framework. Depending on the "rationale", we have three basic options : a) do-nothing - keep the House of Chiefs in its current state; b) abolish the House of Chiefs, or: c) reform. Option (a) is clearly not sustainable given its poor value for money. I have not heard a compelling reason for Option (b) within the existing constitutional framework. Option (c) is attractive, but the national goals again need to drive the sub-options. My current view is that what Zambia is missing is a holistic approach to development. It is missing a view of development that is wholly integrated from the bottom up. Rather than superimposing institutions on people, we need to ensure the institutions reflect the local aspirations of the people. This calls for national institutions to mirror local institutions. Just as there is a stronger role of traditional leadership at the bottom, there is also need for these local institutions to be adequately mirrored at the national level. We can do this either through an independent traditional body that directly advises Parliament on development matters or an expanded stronger second chamber, where chiefs are strongly represented, that directly keeps Parliament in check. Politically, the former would be easier to implement. "We cannot have a council which is full of corrupt councillors. This council is a total failure. My councillors are not working, all they do is chew council money and fatten their stomachs. Most of them were very slim when they were elected and today they can't sleep well because of fats....Look at the garbage in compounds, there are heaps of uncollected garbage as if we don't have the council. I request Honourable Masebo to dissolve this council immediately." The Leader of the Opposition returns to the New Zambia "weekly quotables" (his first 'quotable' can be found here). It appears that corruption is not too difficult to detect. One simply needs to measure the weight before and after the election, all things being equal! Some worrying signs this week that the Kwacha is gaining in strength. With global markets tightening, an even stronger Kwacha could lead to sharper fall in remittances and would impact negatively on existing aid commitments. A UPND Zambia report released March 2008 discusses the same. Legal action against the IMF / World Bank? Indeed, in the mid-term, Zambia should take the World Bank to international courts of law and seek compensation for lost revenue based on misappropriated advice that tightly tied Zambia’s negotiating hands and greatly influenced the outcome of the contracts negotiations. A good example is the mischief portrayed by the World Bank when they assured Zambia that some mines that were sold had finite life spans of up to 7 years........We will know when we go to court. Indeed I have been assured by my very good friends at the London School of Economics and Harvard University in USA that the World Bank and its advisers plus other players have a big case to answer. If taken to court we will win and we will be compensated for lost revenue. This will not be easy but as it stands it is 90 per cent achievable. With little more effort, we will do it. A benefit without a cost? ‘’The fact that they [mining companies] are supposed to pay the windfall tax does not mean that it has changed their financial status in anyway, they are still viable organisations. Therefore, there is no reason for them to reduce the labour force......The excuse of tax for reduction of labour cannot be accepted by government. They have to give another reason, not the reason of tax that government has introduced.....We took all that into account and found that it was a fair action by the government". This is what happens when actions are taken based on poor understanding of how the goods and labour markets interact. Mr Mukuma appears to believe that the government can benefit from new taxes without any cost on our part. One always needs to be careful to separate wishful thinking from rational explanations. As I argued here, increasing taxes will always involve some trade-off in terms of wages or employment, and even safety. Thats why smart trade unions always tend to oppose taxes on businesses, unless of course the higher mining taxes are rebated through lower PAYE. Thats a non-starter of course because the government's aim is not to improve living standards of existing urbanites, but to redistribute the wealth to much more poorer rural Zambians. The 2nd Quarter ZIPPA Journal is out focusing on Economic Empowerment. I have not read it in full but should make interesting reading, especially since it has comments on the Economic Empowerment Act. Yet all delegates repeatedly found themselves challenged by a number of leaders, Mbeki among them, who are loathe to endorse a Tsvangirai presidency for fear of trade unionism taking hold in the region, and who are equally reluctant to stand up to or criticise veteran liberation icons. But their positions were rarely tolerated by Mwanawasa and, for the first time, Mbeki watched his seniority in the camp erode. A number of times throughout the day he was taken to task by his Zambian counterpart, who is also the chairperson of the SADC and who repeatedly appealed for honest brokerage where Zimbabwe was concerned. On more than one occasion, he called on Mbeki to be "sincere" in his approach. "Mbeki kept flip-flopping. He would argue with one side, then with the other. But Mwanawasa wouldn't take it," a member of the Angolan delegation explained. The Zambian leader had made it clear from the onset that it was an emergency summit that required an urgent response. 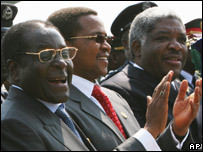 He refused to accept Mugabe's input to the meeting, which came by way of Mbeki. "If Robert Mugabe has anything to say to me as chairperson, then he can talk to me himself," Mwanawasa retorted, reminding Mbeki that he was creating the impression that he was becoming "Mugabe's messenger". The two men all but came to blows later in the night when Mbeki showed reluctance in allowing Tsvangirai to address the meeting, although it had apparently been talked of in advance. Mwanawasa told him as much, reminding the South African president that they had discussed it by phone a couple of days before the summit. "Would you like the whole house to hear the contents of our conversation?" he boldly asked an irate Mbeki, stopping short of accusing him of peddling mistruths. "I am appealing to government to quicken the process of providing motor vehicles to chiefs. When I went to see the clerk of the House of Chiefs, I was told that vehicles were coming. But when are they coming because this is April or may be they will come after I die..... I use a bicycle and I don't tour some areas of my chiefdom. When we ask the district commissioner about the vehicle loans, he only says we should wait. How long are we going to wait?" Illegal allocation of plots is retrogressive and distorts the shape of any city or town because it leads to mushrooming of illegal and unplanned settlements with poor structures, which are mostly blown off or washed away by heavy storms and rains. The mushrooming of illegal settlements confines the plans of any local authority to the drawing boards and any attempts to demolish these illegal structures are met with a lot of resistance by both the residents in the illegal settlements and politicians, who want to gain political mileage by supporting illegal allocation of plots. In Kitwe, there are a number of illegal settlements resulting from illegal allocation of plots by councillors, council officers and Resident Development Committees (RDCs). The residents in these illegal or unplanned settlements even dare the Kitwe City Council (KCC), which is the local authority to demolish their structures, if they have powers to demolish their structures. Yes, they dare the council to demolish their structures because they get powers from some politicians like councillors, who illegally allocate them plots. The residents argue that they cannot be called squatters or their areas cannot be unplanned settlements because during the time of elections, the Electoral Commission of Zambia (ECZ) gives them ballot boxes so that they can also participate or vote in the elections.One resident of St Anthony township in Kitwe, Joseph Chisanga Mwaba told the Times in Bemba that "Ama ballot boxes balaleta ati tubavotele nomba kuti twaba shani ama squatters," meaning they bring ballot boxes so that we vote, but how come they say we are squatters. The Environmental Council of Zambia are currently consulting on the social, economic and environmental impacts of two proposals : New Embassy Compound on Ibex Hill Road and Mukamunya Small Holdings Estate. Good chance to have your say on the robustness of the assessments. Deadline for comments 23rd April 2008. A Committee Report worth reading? Parliament online are doing a great job in publishing some of the Committee Reports, although the interest seems very low (judging from the "hits"). I am sure it has something to do with the unreliable nature of their website, though lack of awareness seems more likely. A lot of 2007 Committe Reports where released in February 2008. If you are only going to read one of the reports there, make sure it is Mulipi's October 2007 on the performance of parastatals. (though the Agriculture Report is a close second!) I have uploaded it separatelybelow, just in case you can't access the Parliament website. Your Committee note that ZAMPOST is facing serious operational problems. While acknowledging lack of financial support to the Company after dissolution of the Posts and Telecommunications Company, they observe that the Company has also suffered from lack of innovation. The Company has failed to reposition itself in the highly technologically advanced business environment that is obtaining. If this state of affairs continues, the Corporation may not be able to improve its financial performance and position. As can be seen from the Profit and Loss Account extract, operating and administration costs were higher than turnover in the years 2002 to 2004 resulting in the Company recording losses from operating activities. It can be further noted that while turnover only increased by 40 percent from 2002 to 2005, Directors’ fees and expenses on the other hand had increased by 240 percent over the same period. In addition, no dividends were declared to the Government and no corporation tax was paid during the period under review. As at December 2005, subscribers owed ZAMTEL K243,976 billion out of which amounts totalling K97,535 billion were owed by the Government. "This is what all councillors debated, both from the opposition and ruling party, they unanimously agreed that the bridge be given the name Levy Mwanawasa bridge. There was no dissenting views." The Minister for Luapula province informing the world that the new bridge across the Luapula River at Chembe will be called the Levy Mwanawasa Bridge. The new bridge is supposed to come with additional works on the notorious Congo Pedicle, where poor security and poor road infrastructure intersect in perfect harmony. Action Alert: Support Zimbabwe now! I don't normally do this (since New Zambia is apolitical), but apparently "the evils of government are directly proportional to the tolerance of the people". So I am putting my conscience before the blog. Please could all the pro-Zimbabwe readers of New Zambia join Sokwanele in this petition to President Mwanawasa and President Mbeki. You'll find all their email addresses / contact details in the post. Thanks! A new paper written by the Tourism Council of Zambia on the implications of Zambia’s revised visa fees on the tourism sector. "Our country exports a number of raw materials that are processed in the developed countries and re-exported back to Zambia as finished goods at exorbitant prices. When we increase the skill levels of labour, we will be increasing value added activities and providing employment opportunities to our own people....."
Of course the problem (and the solution) is much more complicated than Mr Chipungu asserts. The underlying problem is that spillovers from new FDI to domestic firms are not inevitable. The right conditions need to exist for them to occur. A reason why I remain unconvinced by the new Zambian Shenzhen . The problem in Zambia is that we have focused simply on attracting FDI. So Mr Chipungu has a tough task, made even harder by the existing empirical consensus that it is difficult for emerging economies, like Zambia, to extract potential benefits of spillovers when a large technological gap exists between domestic and FDI firms. Its therefore imperative that Mr Chipungu pushes government to place FDI policy within a broader economic policy context. The CEEC should ensure that government takes forward the necessary steps to invest in basic infrastructure, education and training, and above all encourage Zambian firms to invest in technological development. These policies will do a great deal in increasing Zambian firms technological capability, and hence make it easier for the nation to benefit from spillovers. The trouble with "land registration"
......it should be evident, beyond political and ideological biases that the land registration effort has been one of the strongest attempts at improving the security and freedom of peasants. Whether its a lease or an ownership title, having a registered and formal document proving a claim (and rules about how it could be transferred) protects one more from state, local, familial, private dispossession than the stated intentions of a politician. And it is naïve to believe that private ownership alone, by opening the possibility of using land as a collateral would resolve all the problems related to the availability of credit and access to inputs.While Zenawi does make an interesting point about long-term leases providing security, his defence of the land redistribution provision actually provides serious disincentives to productivity. Even the simple possibility of a reasonable government having the option to redistribute land to “correct unfair and inefficient allocation” probably does not encourage farmers to invest their sweat and their savings into improving their plots. The problem with the "land registration" argument is that while it makes theoretical sense, sadly the empirical evidence just does not seem to support it. Reasons for this are largely three-fold. First, historically the long evolution of customary rights to land, which are often quite complex in giving different parts of the "bundle of rights" implied by land ownership to different parties during the harvest cycle, means that issuing further land titles could increase rather than reduce uncertainty. Secondly, for cultural reasons land titling may not bring immediate benefits to women. Finally, the perverse incentives of land registration are all too obvious to ignore. Where land registration has been introduced it has increased rather reduced the scope for the kind of opportunistic behaviour that institutions are supposed to prevent. In most parts of Africa it is not uncommon to find sellers who pledge land as collateral for a loan to fail to inform the buyer of this claim on the land, leading to all kinds of problem for banks. Banks usually fail to auction off the land for political reasons, coupled with the general process of delays in the local courts. Its no surprise that even where titling exists banks generally still find it difficult to accept land as collateral. In short, land registration is most effective within a coherent package that addresses many other issues. Its a first among equals, not a special first. One particular item that bothered me about Mr. Holman's analysis was the solution of the commercial farming center on the Zimbabwean-Mozambican border. Some time ago I read an article mentioning the difficulties that the white Zimbabweans, who were forced off their lands have had in Mozambique. (The following article summarises these issues). I understand that for Zimbabwea to improve, that commercial farming is necessary. However, I do not feel that it is the international community's responsibility to bail these farmers out. The inequality was so great, what did they expect? I understand why Britain ceased its commitment to purchasing white owned farms for land redistribution, however, these farmers enjoyed two decades of prosperous farming following 1981. Equitable distribution of land was a central tenet of majority rule, and allowing descendants of colonialists to continue earning a rent from the status quo land distribution of pre-indpendence was simply untenable. That said, I feel that Zimbabwe will have an immediate need for much more than 38 million UKBP for stabilization efforts. If the commonwealth does undertake the proposed commercial farming project, then benefactors of this project should be chosen out of the large swath of the educated and unemployed population, and not only those of colonial heritage. By instead using the 38 million UKBP for development projects involving the recently dispossessed, Britain will find itself in the perverse situation of reinstating the pre-independence land distribution. JCTR produce a monthly "basic needs basket", that tracks how prices are changing in Lusaka, (and are separately taking forward a rural basket). See the latest press release and associated data for March 2008. It shows a 20% year on year increase in prices for a family of six in Lusaka. Quite insightful given that the official figures have national inflation at under 10%. The JCTR release would suggest the national figures must be 'hiding' a lot of inflation variability i.e. higher urban inflation / very low rural inflation. To really know whether this matters, we need to see whats happening to wages across the spectrum. I am off to hunt for the data! The government's human rights record remained poor, although there were improvements in a few areas. Human rights problems included: unlawful killings; torture, beatings, and abuse of criminal suspects and detainees by security forces; poor and life‑threatening prison conditions; arbitrary arrests and prolonged detention; long delays in trials; arbitrary interference with privacy; restrictions on freedom of speech and press, and intimidation of journalists; restrictions on assembly and association; government corruption and impunity; violence and discrimination against women; child abuse; trafficking in persons; discrimination against persons with disabilities; and limited enforcement of labor rights and child labor laws. I have to admit that these are indeed familiar themes in Zambia. In terms of the "weak state index", the question I guess is the extent to which these are worse in Zambia compared to other countries. But does that matter anyway? Zambia needs to get its act together on this and more needs to be done by those with the power to do it. Mozambique's government has approved the construction of an oil refinery in an $8 billion deal designed to reduce the nation's dependency on imported fuels. The refinery in southern Maputo province will be capable of producing 350,000 barrels of refined fuel per day when it becomes operational in seven years. This comes off the back of another $5 billion deal with U.S. firm Ayr Logistics for the construction of a refinery in Nacala-a-Velha in the northern Nampula province. You can read more about Mozambique's oil and gas industry at Mbendi. "....Most of these succession disputes are due to greed because the positions have become lucrative. Even where boundaries are clear, some traditional leaders are still encroaching on other people’s land and even selling it. Government is concerned and President Mwanawasa is not happy about such disputes. He has been advising traditional leaders to sort out disputes amicably instead of dragging each other to court...."
The Minister for Local Government and Housing, Silvia Masebo warning that she will not hesitate to recommend to President Mwanawasa to de-register chiefs whose families are constantly in succession disputes. It appears that she has forgotten that the root cause of all these problems is two fold: a lack of an coherent cultural approach to development that recognises the role of chiefs and the absence of effective land reform. Simply put, most of our chiefs are poor, not well integrated into local and central government, and are now at the mercies of foreign investors. The only surprise here, is that Ms Masebo and her advisers are surprised. How weak is your country? A new report by the Brookings Institution ranks and evaluates 141 developing nations based on their relative performance in four critical areas: economic, political, security and social welfare. This paper presents the Index of State Weakness in the Developing World, which ranks all 141 developing countries according to their relative performance in four critical spheres: economic, political, security, and social welfare. We define weak states as countries that lack the essential capacity and/or will to fulfill four sets of critical government responsibilities: fostering an environment conducive to sustainable and equitable economic growth; establishing and maintaining legitimate, transparent, and accountable political institutions; securing their populations from violent conflict and controlling their territory; and meeting the basic human needs of their population. We measure state weakness according to each state’s effectiveness in delivering on these four critical dimensions. Contrary to some conventional usage, we do not equate “strong” states with authoritarian or semiauthoritarian regimes that impose their will within or beyond their borders, a criterion that would make North Korea, for example, a strong state (rather than a weak one, as we regard it). Instead, a state’s strength or weakness is a function of its effectiveness, responsiveness, and legitimacy across a range of government activities. Zambia is ranked the 32nd weakest state in the world (click image below for clarity) . I'll let you be the judge on the robustness of this report, especially with respect to the data. Some themes on Zambia seem familiar (poor government effectiveness, infant mortality, undernourishment etc) others less so (high inflation, gross human rights abuses - some politically motivated abuse of rights, but surely not gross?). Musings on a post-Mugabe Zimbabwe, revisted. We had a very fascinating discussion on a post-Mugabe world. Zimbabwean blogger, Izzy Mutanhaurwa revists the issue in his blog How will we unhook Zimbabwe from the tentacles of securocrats? . Much as I dislike monopolies, I disagree with the ZCC's involvement in issues of shareholding. What does it matter whether a company has a single shareholder or two or several? The competition we want is not between shareholders but between market players. Whether BP is sole owner of the Zambia's only jet fuel supplier, or whether the supplier is jointly owned by BP and Mobil, is immaterial. The supplier is still a monopoly. One can even argue that it is more dangerous if jointly owned by BP and Mobil, because then there is no possibility that Mobil will come in as a competitor. Equally, it is silly to object to Vedanta owning a majority of KCM shares. The competition we need is between companies, not within companies. A new approach to African rigging? The traditional pattern to rigging in Africa is simple : the opposition runs an electric campaign, but the party in government manipulates the voting register in rural areas before the voting takes place. The vote is then held, and then lo and behold, the opposition takes the lead in urban areas, and with euphoria declare themselves early winners. After a day or so, rural votes start coming in and eventually the opposition team is deflated. The crucial point is that rigging occurs before the vote, not during the election. That was the pattern in Africa, the question is whether Zimbabwe may bring new creativity to the art of rigging. It appears that rather than overtly rig the voting registration process, the approach is simply to dispute the results in some form and then create the inevitability of a run-off. The hope is that during the run-off you can use all the state machinery to bring the opposition into submission. Simply put, in a second run-off members of the opposition would be too deflated and financially broke to mount a second campaign. You can easily control their source of funding and by making a few arrests you can instill fear. The party in government of course can always use state resources, assuming the state has some resources. The problem is the new art carries the risk of a serious power vacuum that the military may only be too keen to fill. The problem is that this response ignores the root cause of the high prices. The reason for these high costs is just inefficiencies in refinery. Rather than explaining their procedures, ERB should be asking the fundamental question of why the refinery process in Zambia is so expensive. There story on tax is also incomplete. ERB rightly acknowledges the unnecessary 5% import duty, but it purposely ignores that jet fuel is taxed with 17% VAT, despite the fact that usually fuel is entirely tax free. medicines for clinics, fuel for transport. On the agenda would also be ways to kick-start the country’s hard-hit tourist industry, once a leading foreign exchange earner and an important employer. Perhaps this could take the form of a one-off offer to foreign visitors of a holiday, at cost, in one of Zimbabwe’s many game parks. Britain’s Department for International Development should invest the £30m (€38m) it has earmarked for an orderly land reform programme in a commercial farming centre, located on the Mozambique-Zimbabwe border, where dispossessed farmers might regroup to use their expertise. Meanwhile, newspapers could lead an appeal for books; magazines and academic journals could provide free subscription to the country’s schools and universities and libraries. This package of measures would be published and made available to every Zimbabwean, telling them what the future holds. Who better to co-ordinate the programme than the Commonwealth, that near-moribund association of 50-odd countries, linked by a history of association with Britain? It was a Commonwealth summit in Lusaka, Zambia’s capital, in 1979 that helped lay foundations for Zimbabwe’s inde­pendence elections the following year. Our main findings confirm some previous results in the literature—in particular, that external shocks and macroeconomic volatility are negatively associated with the length of growth spells, and that good political institutions help prolong growth spells. We also have some more surprising findings. Trade liberalization, seems to help not only in getting growth going, as emphasized by previous authors, but also in sustaining it—particularly when combined with competitive exchange rates, current account surpluses, and an external capital structure weighted toward foreign domestic investment (see also Dell’Ariccia and others (2008) on this latter point). Furthermore, we find that export composition matters. Consistent with the findings of Johnson, Ostry, and Subramanian (2006, 2007), Hausmann, Hwang, and Rodrik (2006) and Hausmann, Rodriguez, and Wagner (2006), we find that the manufacturing share in exports, and more generally, export product sophistication tend to prolong growth. Most strikingly, we find that the duration of growth spells is strongly related to income distribution: more equal societies tend to grow longer. An interesting fact sheet on migration and remittances.